Spending thousands of dollars on artwork for the home is not necessary. 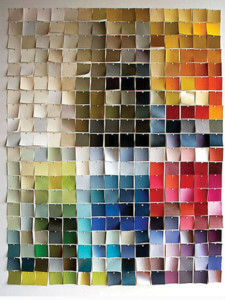 If one creates his own artwork, the colors, style and shapes can be customized per one’s personal taste. 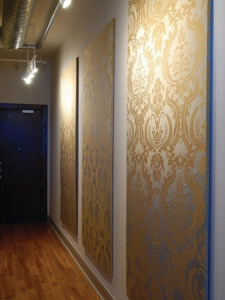 Creating custom art allows one to be able to take extra pride when creating beautiful rooms. These papers come in an array of trendy colors and patterns for easy and inexpensive artwork. 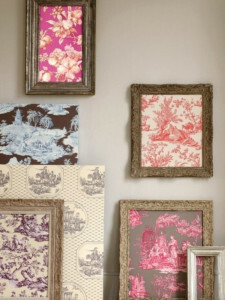 Select patterns that can be mixed together to match the room’s color scheme and decor and display in matching frames to create a beautiful creative wall art. Gallery photography can be expensive so try using personal photographs as art. Take high-resolution digital pictures (most standard cameras are high resolution; phone cameras may not work).Then select the ones to be enlarged for the creation of a personalized grouping. 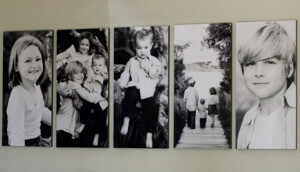 There are many online photo to canvas companies (Canvas4life) that allow a photo to be plugged in and the resolution and color to be tested before ordering and printing. This eliminates the fear of the print turning out blurry. The photos selected can be cropped (maybe only partially showing the subject) or color brightened or reduced to black and white. Be creative. All kinds of experimenting can be performed before placing the order. Pick up a few paint samples when visiting the local home improvement store. (Actually, more than a few may be needed.) Using a pre-stretched canvas from a craft or art supply store, attach the paint chips in any preferred pattern and attach with a thumbtack to create colorful custom art. Using bubble wrap already on hand, paint acrylic (from craft store) paint on top of the bubbles in stripes and in favorite colors. Then flip the painted side over quickly, place it on pre-stretched canvas or water color paper, and press lightly. Lift off the plastic wrap to see the final result. Using pre-stretched canvas, paint an acrylic base coat of selected color and let it dry fully. Then get blue painter’s tape (one inch works well) and tape in random patterns on top of what was painted earlier. Tape can be placed in X’s or stripes or diagonals or any other selected pattern. Next, paint in multiple colors (4 or 5 of acrylic paints) across the placed tape on canvas. Let that layer dry,then pull off the painter’s tape to reveal a masterpiece. One can think of a saying he likes and wishes to display. Purchase the sticky vinyl letters at a craft store. Using pre-stretched canvas, paint in acrylic paints multiple colors in random patterns across the canvas and allow to dry. A thrift store painting or a painting already owned can be used. Place and stick the verbiage of your choice in the vinyl letters onto the painting or canvas that was previously painted with multiple colors. Next take a color of one’s choice (this will be the predominant color) and brush in acrylic paint over the entire canvas and the letters. Let that color dry and peel off the letters to see your colorful wording appear as custom art. Stencils may be purchased in craft stores and come in a large variety of patterns. Stencils can create quick custom art using a wide variety of choices of colors and patterns and layering them together on watercolor paper or canvas.